A free, eco-friendly way to get around downtown St. Petersburg will soon be whisking riders around aboard electric vehicles capable of transporting up to five passengers, plus a driver, courtesy of The Nickel Ride Co. This relative newcomer to “urban mobility” is all about easing traffic and offering an alternative to individual cars within select high-density corridors. In exchange, gas-fueled engine emissions should decrease and businesses should benefit from the community-based ride sharing that delivers customers directly to their doors. 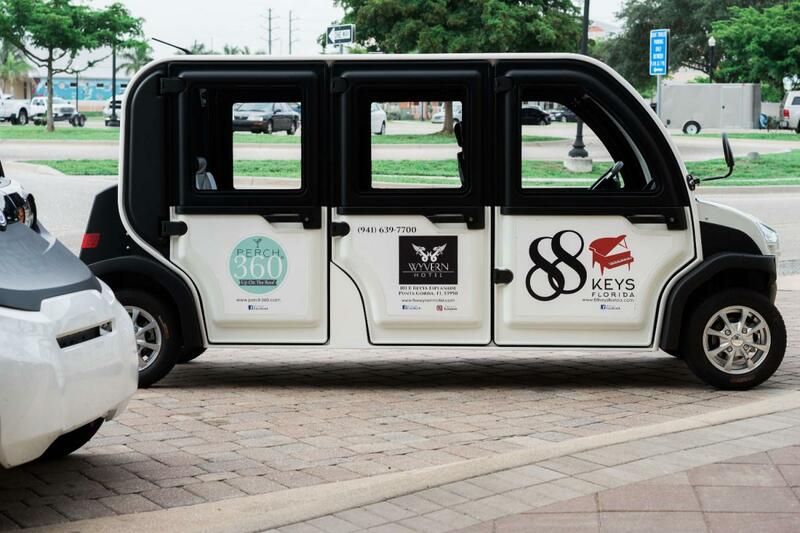 St. Petersburg adds Nickel Rides to its roster of transportation options available to the public in August when it will welcome eight vehicles and become the fourth city with a Nickel Car fleet. Working with local business partner Ferg’s Sports Bar & Grill, officials with The Nickel Ride invite the public to attend a launch event at that popular spot on Friday, Aug. 3, from 6 - 8 p.m.
How can this be free? Vehicles serve as moving and interactive billboards that feature graphics and TV screens to display ads and offers for local businesses plus an app that pushes targeted promotions to passengers summoning rides. Even those who skip the app to simply board at designated pick up site will still be able to view ads as they ride and may receive coupons from participating businesses. Tipping drivers is permitted and can be done through the app or with cash or a credit card. Pick-up locations and routes will encompass the I-175, I-275, and I-375 highways to North Straub Park to The Dali Museum area. Note that The Nickel Ride strives to provide transport to all addresses within its service area but is unable to deliver passengers to destinations on streets with speed limits over 35 mph. Vehicles will get as close as possible to the desired destination while avoiding those streets. The Nickel Ride Co. was launched in Fort Myers in 2017 as a means of minimizing the carbon footprints of cars and reduce traffic congestion in high-density downtown areas while offering riders a convenient and comfortable way to travel to local businesses. Cape Coral and Punta Gorda are other cities currently on board with The Nickel Ride. Want to know about things to do in the Tampa Bay area? Simply register at 813area or 727area. It's easy and free!